How Tunisia's 'Quartet' Saved A Country From Civil War And Won The Nobel Peace Prize : The Two-Way Before the Quartet was formed, Tunisia seemed doomed to walk the same path of violence, retributions and political chaos that had wreaked havoc in Egypt. 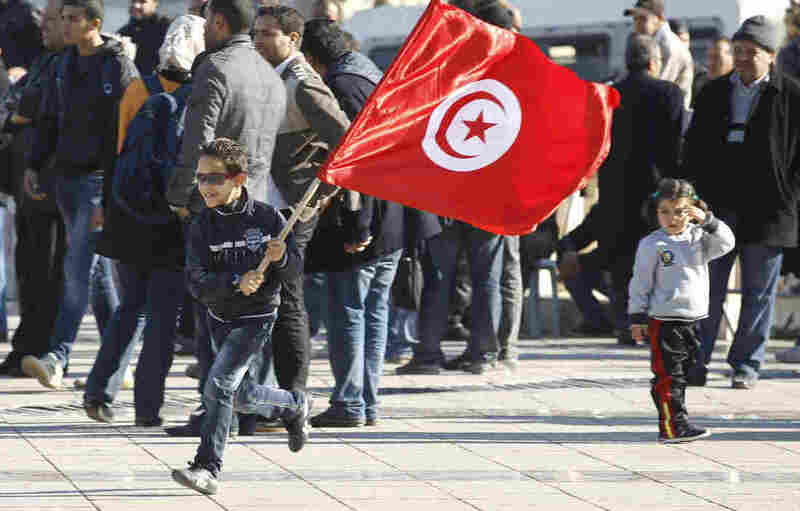 December 2013: A Tunisian boy waves a flag as he runs at a rally in Tunis, marking the third anniversary of Tunisia's revolution. A prominent member of the group that's credited with averting civil war in the country says the group acted "to give hope to young people." Many people were shocked Friday when the Nobel Prize Committee awarded this year's Peace Prize to a pro-democracy group that helped Tunisia restore the dream of democracy that was born in the Arab Spring of 2011. Tunisia's National Dialogue Quartet beat out Pope Francis and Germany's Chancellor Angela Merkel — and 270 other candidates — to take the prize, which the Nobel Committee said had guaranteed "fundamental rights for the entire population, irrespective of gender, political conviction or religious belief." But that left many people wondering: Who is this group that operates without a leader and that is so committed to unity that its prize is listed as a solitary award, instead of a four-way split? The short(-ish) answer is that the Quartet is a mix of civil society groups — labor, business, human rights and legal groups — whose leaders became mediators between Tunisia's Islamists and secularists and saved their country from civil war. "I think this is a message to the world, to all the countries, to all the people that are aiming for democracy and peace, that everything can be solved by dialogue," said Mohamed Fadhel Mahfoudh, president of The Tunisian Order of Lawyers, after learning that the Quartet he's part of had won a Nobel Peace Prize. To put the group's work in perspective, NPR's Leila Fadel reported on Morning Edition on Friday, "Tunisia was the first country to revolt against authoritarian rule in the Middle East, and it set off a domino effect. And now it's really the only country in the region that remains on a path to democracy." For a sense of what the Quartet accomplished, you have to look back to its roots, in the summer of 2013. Before the Quartet was formed, Tunisia seemed doomed to walk the same path of violence, retributions and political chaos that had wreaked havoc in Egypt — another country that had struggled to restore security and economic growth after a revolution deposed its longtime ruler. In 2013, Tunisia was reeling from the assassination of figures who led the opposition to its ruling Islamist party, Ennahda. After the first of those killings — of outspoken lawyer Chokri Belaid — the country's prime minister resigned, adding even more uncertainty to the political scene. In the summer of 2013, two years after Tunisia's Jasmine Revolution, protesters were filling the streets, calling for the elected government to vacate its offices. Those events unfolded in the shadow of Egypt, where President Mohammed Morsi was overthrown. As Leila reported in September of 2013, Egypt served as "a cautionary tale" for many Tunisians. In the end, the ability to form alliances between Islamist and secular politicians became a key to Tunisia restoring the hope of forming a pluralistic society. And it began with the Quartet calls for a national dialogue. Made up of the General Labor Union; the Tunisian Confederation of Industry, Trade and Handicrafts; the Tunisian Human Rights League; and the Tunisian Order of Lawyers, the Quartet's leaders persuaded the Islamist Ennahda party to join in talks that formally began on Oct. 5. As history professor Habib Kazdaghli of the University of Tunis in Manouba said in October of 2013, the national dialogue "occurred only because it was preceded by a series of painstaking consultations and preliminary conversations with Tunisia's various political factions." The dialogue didn't immediately resolve the strife that had wracked Tunisia, but as Kazdaghli said at the time, "the fact the session was held at all is an important event." The session also included the acceptance of the Quartet's national road map, which called for the existing government to resign and be replaced by technocrats. That road map document was signed as the dialogue began, but it wasn't until late December, after months of negotiations, that a more detailed plan was agreed upon. Applauding the Quartet's effort, the Nobel Committee said today, "More than anything, the prize is intended as an encouragement to the Tunisian people, who despite major challenges have laid the groundwork for a national fraternity" that could be a model for other countries. "We are here to give hope to young people in Tunisia, that if we believe in our country, we can succeed," Ouided Bouchamaoui, who leads a business association that's part of the Quartet, said Friday. Today, Tunisia's government is headed by Habib Essid. He was recently asked whether his country is a success story. "Can we consider ourselves as a success? You know, it's hard to say that we are a success, but we are working. We did a smooth transition, and now we have institutions." He added, "We have many challenges — important challenges."